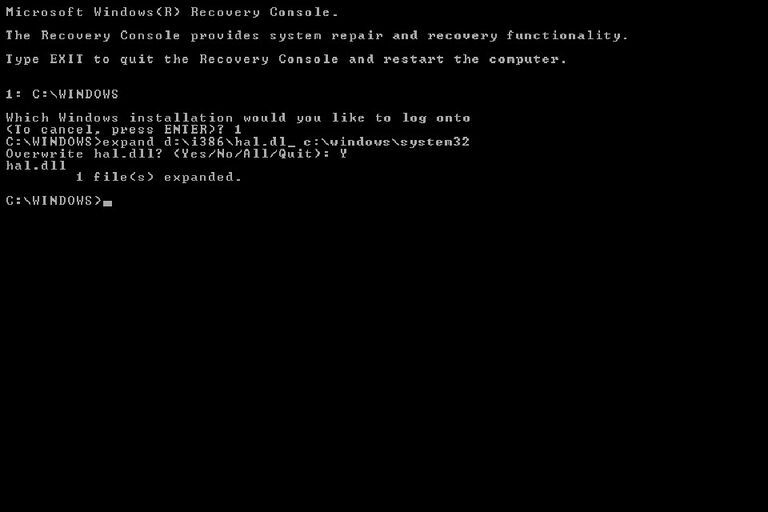 Recovery Console hal.dll Restore Command. The hal.dll file is a hidden file that is used by Windows XP to communicate with your computer's hardware. Hal.dll can become damaged, corrupted or deleted for a number of reasons and is usually brought to your attention by the "missing or corrupt hal.dll" error message. Follow these easy steps to restore the damaged/corrupted or missing hal.dll file from the Windows XP CD using the Recovery Console. Hall.dll errors can occur not only on Windows XP but also Windows 10, Windows 8, Windows 7, and Windows Vista. However, hall.dll errors found in later versions of Windows are usually the result of a different problem. See How to Fix Hal.dll Errors in Windows 7, 8, 10, and Vista if the hall.dll error isn't happening on Windows XP. Restoring hal.dll from the Windows XP CD is an easy process that should take less than 15 minutes to complete. Using the expand command as shown above, d represents the drive letter assigned to the optical drive that your Windows XP CD is currently in. While this is most often D, your system could assign a different letter. Also, C:\windows represents the drive and folder that Windows XP is currently installed on. Again, this is most often the case but your system could be different. Make sure you pay attention to where spaces belong in this command. The "expand" command is by itself, and so a space is needed after it before you enter the path to the optical drive. The same is true for the c drive's \system32\ path - make sure there's a space before you start typing C.
If you're prompted to overwrite the file, press Y. Take out the Windows XP CD, type exit and then press Enter to restart your PC. Assuming that a missing or corrupt hal.dll file was your only issue, Windows XP should now start normally. If your disc drive isn't working or it's for some reason missing entirely, you can still copy the hal.dll file to the right place on the C drive. The only caveat here is that you, of course, must have the hal.dll file stored somewhere else, like on a floppy disk. Some sources will tell you it's OK to download DLL files like hal.dll from sources online, but we don't recommend it. As easy as that is, the DLL file might be infected with a virus, be outdated, or just not be the original file, and can cause even more problems for you. Your best bet is to use another computer to copy the hal.dll from the XP disc to a floppy. If you're using a floppy disk, you first have to format it and make it bootable, and then of course boot to it by changing the boot order in BIOS. If you need help formatting the floppy in XP, there are instructions in this Computer Hope piece. Again, like you read above, these drive letters may be unique depending on how your computer is set up, but usually, the A and C drives are reserved for the floppy drive and Windows drive, respectively.